Chicken Alfredo Stuffed French Bread is a crusty loaf of bread with cheesy chicken alfredo inside. It can be served as a meal or as a savory party dish. 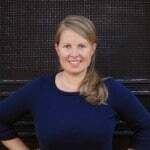 I’m excited to partner with Reynolds for this post. Looking back over my most popular posts from the past year, I noticed that you love chicken alfredo as much as we do! We love making chicken alfredo pizza, chicken alfredo spaghetti squash, and chicken alfredo tortellini. Now we have another recipe to add to the list: Chicken Alfredo Stuffed French Bread. 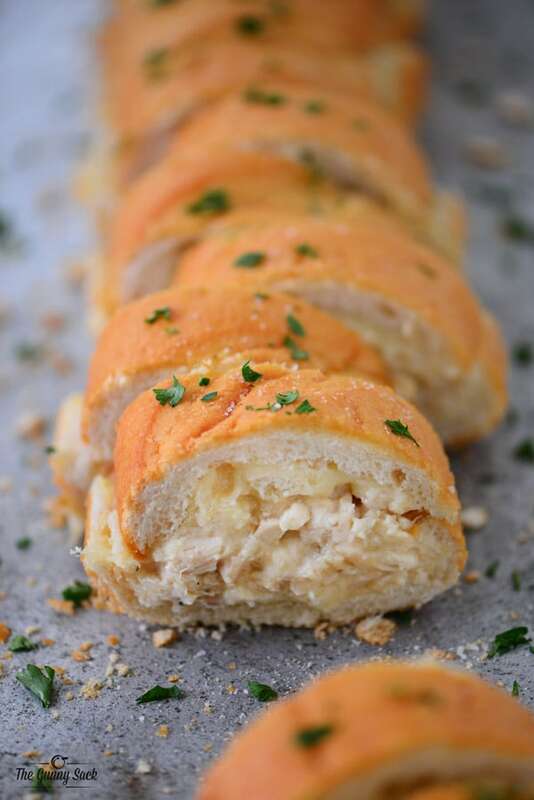 We had this Chicken Alfredo Stuffed French Bread as part of a meal but it would also be a fantastic party dish! 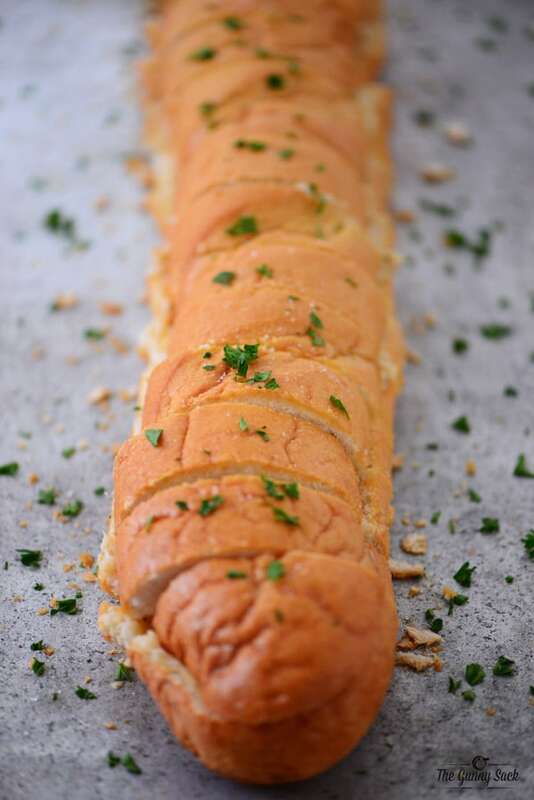 Cut a loaf of french bread in half and pull out the soft bread in the center. Put the bread chunks in a large bowl and break into small pieces. 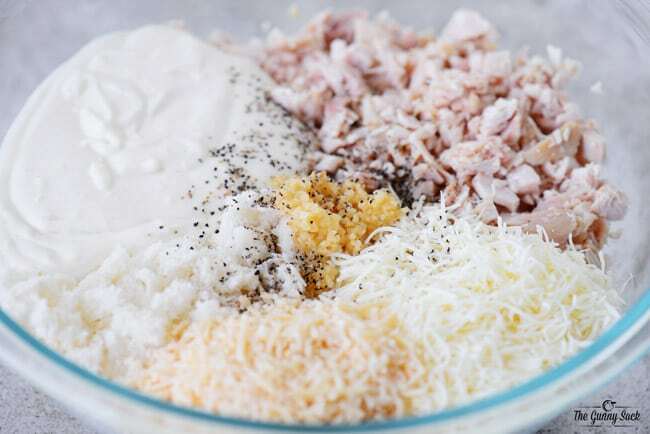 Add diced, cooked chicken (I used rotisserie chicken), alfredo sauce, mozzarella cheese, parmesan cheese, minced garlic, and pepper to the bowl with the bread pieces and stir until combined. Microwave the chicken alfredo mixture on high for 3-5 minutes, stirring halfway through. 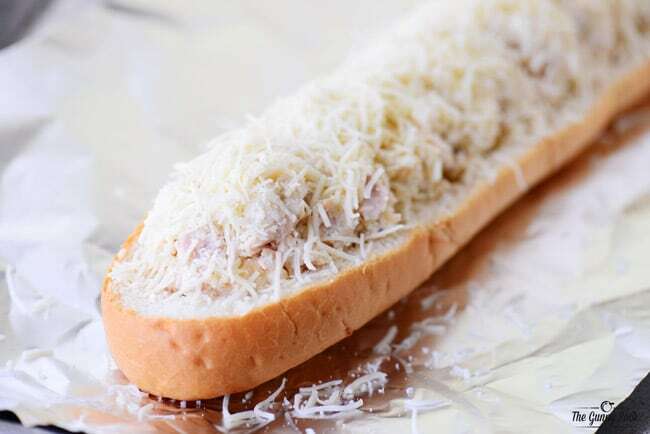 Scoop the heated alfredo chicken mixture into one of the halves of the French bread loaf, sprinkle with additional shredded mozzarella cheese and top with the second half of the loaf. Brush with melted garlic butter. 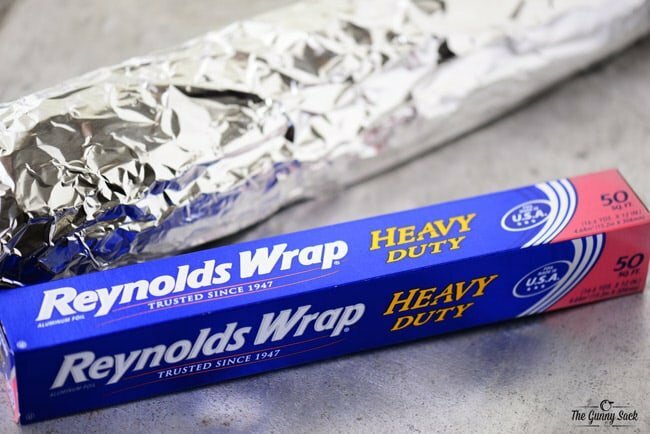 Wrap the stuffed bread with Reynolds Wrap Heavy-Duty Aluminum Foil. Bake at 400 degrees for 25-30 minutes or until heated through. For crisper bread, you can bake the loaf uncovered for the last 5 minutes. Carefully unwrap the foil, cut the Chicken Alfredo Stuffed French Bread into slices and garnish with chopped parsley. 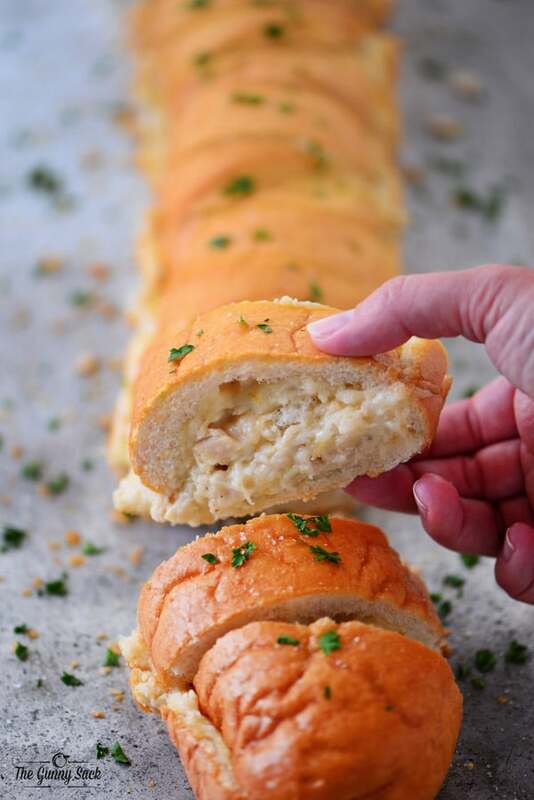 I brought a loaf of this Chicken Alfredo Stuffed French Bread to my sister’s house and her kids told me that they loved it and all wanted seconds. They told me that their youngest sister didn’t want to try it at first but they got her to change her mind and she ended up loving it too. This recipe has become a family favorite which is totally great because it is so easy to make. We will be making it often for our weekly meals and to share with family and friends at potlucks and parties. Chicken Alfredo Spaghetti Squash: This Chicken Alfredo Spaghetti Squash recipe is low carb comfort food that is easy to make. Your family won’t even miss the pasta! Chicken Alfredo Soup: Chicken Alfredo Soup is homemade comfort in a bowl. With chicken, alfredo sauce, noodles, and bacon, this soup is perfect for a family dinner on a cold winter night. Chicken Fettucini Alfredo from Natasha’s Kitchen: Mom’s creamy Chicken Fettuccine Alfredo has been a family favorite for years. Classic Chicken Alfredo is a feel good comfort food – so creamy but light! Instant Pot Chicken Alfredo from The Recipe Critic: This Instant Pot Chicken Alfredo Pasta is an easy, one pot meal that cooks in record time! It’s creamy, comforting and hearty! Chicken Alfredo Pot Pie: This Chicken Alfredo Pot Pie recipe has a creamy alfredo sauce filled with juicy chicken and tender vegetables topped with a flaky, golden crust. Slow Cooker Chicken Alfredo Tortellini: Slow Cooker Chicken Alfredo Tortellini is warm, comfort food at it’s finest. This easy, crockpot recipe will quickly become a favorite family dinner! 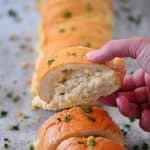 Chicken Alfredo Stuffed French Bread is a crusty loaf of bread with cheesy chicken alfredo inside. It can be served as a meal or as a savory party dish. 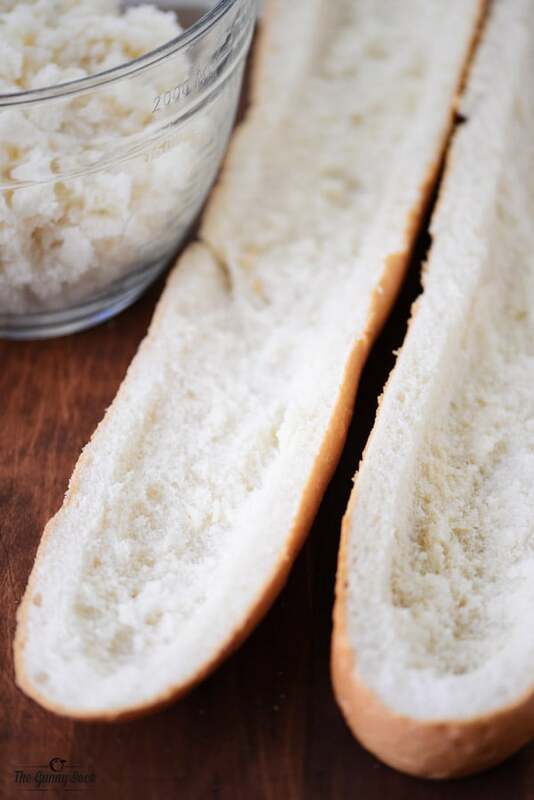 Cut the loaf of french bread in half and pull out the soft bread in the center. Put the bread chunks in a large bowl and break into small pieces. Add diced, cooked chicken, alfredo sauce, 1 cup of mozzarella cheese, parmesan cheese, 2 teaspoons minced garlic, and pepper to the bowl with the bread pieces and stir until combined. Microwave the chicken alfredo mixture on high for 3-5 minutes, stirring halfway through. Scoop the heated chicken alfredo mixture into one of the halves of the French bread loaf, sprinkle with the remaining 1/2 cup of shredded mozzarella cheese and top with the second half of the loaf. Mix 1 teaspoon minced garlic with the melted butter and brush over the loaf. Carefully unwrap the foil, cut the Chicken Alfredo Stuffed French Bread into slices and garnish with chopped parsley, if desired. This is a sponsored post written by me on behalf of Reynolds. The opinions and text are all mine. Oh YUM! The chicken and the garlic bread all in one – LOVE it! My husband is a total Alfredo fanatic, and he would go crazy for this bread! Oh my goodness, now this is what I want for dinner! Yum! It does look so amazing, i am looking forward to making this myself. Oh my goodness! This looks like heaven! I can’t wait to give it a try! Alfredo in bread? OMG!! I can devour that all by myself!! OH MY this bread!!! I love alfredo and bread and together I would be in heaven. This looks absolutely amazing! I love anything cheesy stuffed into bread. Sharing!! This looks absolutely fantastic! I love alfredo and turning it into stuffed bread is genius!